"If there is even a remote chance that this pivotal point in the Mormon story is a fabrication, what Latter-day Saint would not want any and all of the pertinent facts?" 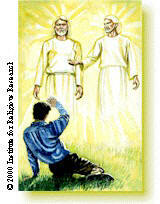 The First Vision of the Prophet Joseph Smith constitutes the groundwork of the Church which was later organized. If this First Vision was but a figment of Joseph Smith's imagination, then the Mormon Church is what its detractors declare it to be - a wicked and deliberate imposture (The Abundant Life, pp. 310-311). According to the historical evidence Joseph Smith could not have been stirred by an 1820 revival to ask which church was true, since there was no revival in 1820 anywhere near Manchester, New York, where he was living. A revival as described by Joseph Smith did occur there beginning in the spring of 1824. However, this then seriously disrupts Joseph's whole story, because there is not enough time between the First vision and the 1830 publication of the Book of Mormon for all the events described in the First Vision story. There are other earlier accounts of the First Vision, including one handwritten by Joseph Smith himself, which make no mention of an appearance of the Father and the Son. Instead, these earlier accounts refer to an angel, a spirit, many angels, or the Son. The story in its present form with the Father and the Son, did not appear until 1838, many years after Joseph claimed to have had the vision. The details now known about Joseph s early life contradict his claim that he was persecuted in 1820 for telling the story of the First Vision. As a young man he participated in Methodist meetings, and later joined a Methodist church class. No persecution is recorded. Joseph Smith's neighborhood experienced no revival in 1820 such as he described, in which great multitudes joined the Methodist, Baptist, and Presbyterian churches. According to early sources, including church conference reports, newspapers, church periodicals, presbytery records and published interviews, nothing occurred in 1820-21 that fits Joseph's description. There were no significant gains in church membership in the Palmyra-Manchester, New York area,3 during 1820-21 such as accompany great revivals. For example, in 1820, the Baptist Church in Palmyra only received 8 people through profession of faith and baptism, the Presbyterian church added 14 members, while the Methodist circuit lost 6 members, dropping from 677 in 1819 to 671 in 1820 and down to 622 in 1821 (see Geneva area Presbyterian Church Records, Presbyterian Historical Society, Philadelphia, PA; Records for the First Baptist Church in Palmyra, American Baptist Historical Society, Rochester, NY; Minutes of the [Methodist] annual Conference, Ontario Circuit, 1818-1821, pp. 312, 330, 346, 366). about this time there was a great revival in religion and the whole neighborhood was very much aroused to the subject and we among the rest, flocked to the meeting house to see if there was a word of comfort for us that might relieve our over-charged feelings (First draft of Lucy Smith's History, p. 55, LDS Church Archives). Does a discrepancy of four years cause a major problem for Joseph's story? It certainly does. Joseph described a 10-year sequence of events that begins with the First Vision and ends with the publication of the Book of Mormon in 1830. If this sequence did not start until 1824, there are only six years in which to fit the ten year sequence Joseph claims occurred before the Book of Mormon was printed. In the story as it appears in Mormon scripture, Joseph says that in 1823, three years after the 1820 First Vision, he was visited by the angel Moroni. Moroni tells Joseph about the gold plates but says he must wait four years before obtaining them. In 1827 Joseph gets the gold plates and three years later (1830) publishes the Book of Mormon. However, recall that Joseph linked the First Vision to a great religious excitement in the Manchester-Palmyra area. As documented above, we now know that this revival took place, not in 1820, but in 1824. This means that the angel Moroni's initial visit three years after the First Vision would have to be dated to 1827. When we add the four additional years Joseph said he had to wait to get the plates, he would not even have had them until 1831. But by this time the Book of Mormon was already in print. The 10-year sequence of events which Joseph spells out in his First Vision story simply will not fit into the span of time between 1824 and the 1830 publication date of the Book of Mormon. How did the story of Mormon origins become so confused? Part of the answer is found in the fact that Joseph Smith himself told the story several different ways. In about 1832, Joseph Smith, began an account of the origin of the Mormon Church (the only one written in his own hand) that is considerably different from the official First Vision story he dictated some six years later. This 1832 account, which has been referred to as Joseph's strange account, was never finished and for many years remained inaccessible to the public. It was published in BYU Studies, Spring 1969, pp. 278ff, and is also included in Dean C. Jessee's The Personal Writings of Joseph Smith (Salt Lake City: Deseret Book, 1984, pp. 14ff). by searching the Scriptures I found that mankind did not come unto the Lord but that they had apostatized from the true and living faith and there was no society or denomination that built upon the Gospel of Jesus Christ as recorded in the New Testament (Personal Writings, p. 5). Six years later, when Joseph set forth his official First Vision account, he changed his story and no longer claimed his personal Bible study led him to the conclusion that all churches were wrong. Instead, he said that the Father and the Son told him that all the churches were wrong and he must join none of them. (Ironically, Mormon historians have documented the fact that Joseph Smith joined a Methodist church class in 1828, which would seem to constitute a direct violation of the claimed divine command "to join none of them. "5 He claimed to be surprised by this announcement, for he added parenthetically, "at this time it had never entered into my heart that all were wrong." Yet, in stating this, Joseph contradicted himself, for a few paragraphs earlier in this same account he recorded: "I often said to myself ... Who of all these parties are right; or are they all wrong together?" The statement — "it had never entered into my heart that all were wrong" — appears in the original manuscript (see BYU Studies cited previously, p. 290), and in the first (1851) edition of the Pearl of Great Price. This phrase, which contradicts Joseph's earlier statement, was edited out of later editions of LDS scriptures until sometime after 1980, when it was inserted back into English language editions of the PGP. It was also omitted from some foreign language editions, including Spanish and Portuguese, until sometime after 1989 when it was inserted in those as well. Even without this contradiction the 1838 official account conflicts with the 1832 version. In the 1832 account it is Joseph's Bible reading that stirs him to seek God, while in the 1838 story it is a (non-existent 1820) Palmyra-area revival that motivates him. In the 1832 version Joseph only mentions the appearance of Christ, while in the 1838 rendition he claims both the Father and the Son appeared. In the 1832 account he already knows all the churches are wrong, while in the 1838 story he says it never occurred to him that all were wrong until the two deities informed him of this fact. Still another version of the First Vision was published in 1834-35 in the periodical, Latter-day Saints Messenger and Advocate (Vol. 1, pp. 42, 78). This account was written by LDS leader Oliver Cowdery with the help of Joseph Smith. It tells how a revival in 1823 caused 17-year-old Joseph Smith6 to be stirred up on the subject of religion. According to Cowdery, Joseph desired to know for himself of the certainty and reality of pure and holy religion (p. 78). He also prayed if a Supreme being did exist, to have an assurance that he was accepted of him and a manifestation in some way that his sins were forgiven (Ibid., 78, 79). According to this account, an angel (not a deity) appeared in Joseph's bedroom to tell him his sins were forgiven. The conflicts produced by this account are numerous. First, the date of the revival is given as 1823, instead of 1820. Second, if Joseph had already had a vision of the Father and the Son in 1820, why did he need to pray in 1823 about whether or not a Supreme being existed? Third, when the revival prompts him to pray, the personage that appears is an angel, not the Father or Son. Fourth, the message of the angel is one of forgiveness of sins, rather than an announcement that all the churches were wrong. These widely divergent accounts raise serious questions about the authenticity of Joseph Smith's First Vision story. Different people may have varying views of the same event, but when one person tells contradictory stories about the same event, we are justified in questioning both the person and the truthfulness of the story. There is little if any evidence, however, that by the early 1830s Joseph Smith was telling the story in public. At least if he were telling it, no one seemed to consider it important enough to have recorded it at the time, and no one was criticizing him for it. Not even in his own history did Joseph Smith mention being criticized in this period for telling the story of the First Vision ("The Significance of Joseph Smith's First Vision in Mormon Thought", Dialogue: A Journal of Mormon Thought, Autumn 1966, p. 30). There was no revival anywhere in the Palmyra-Manchester, New York area in 1820. The events as told by Joseph Smith will not fit into the time period between the 1824 revival and the 1830 publication of the Book of Mormon. Joseph was welcomed, not persecuted, by the Methodists. In his 1832 account Joseph said it was by personal Bible study that he determined all the churches were apostate, while in his 1838 account he said it "never entered into my heart that all were wrong." In his 1832 version Joseph claimed to see only a vision of Christ and in his 1835 version Joseph told of the visit of an angel, while in the 1838 story the message came from the Father and the Son. No one knew of today's version of the First Vision until after Joseph dictated it in 1838, and no published source mentions it until 1842 (Ibid., pp. 30ff). The conflicts and contradictions brought to light by the preceding historical evidence demonstrate that the First Vision story, as presented by the Mormon church today, must be regarded as the invention of Joseph Smith's highly imaginative mind. The historical facts and Joseph's own words discredit it. 1. Brigham Young University professor James B. Allen, in "The Significance of Joseph Smith's First Vision in Mormon Thought", Dialogue: A Journal of Mormon Thought, Autumn 1966, p. 29. Allen was an LDS bishop at the time. 2. For example, the Mormon church magazine the Ensign, April 1995, featured a six page article on the importance of the First Vision titled, "Oh, How Lovely Was The Morning! : Joseph Smith's First Prayer and the First Vision." It gave no clue to the serious conflicts between Joseph's First Vision story and the historical evidence. 3. Palmyra and Manchester were immediately adjoining towns. 4. Lane wrote that the Lord s work in Palmyra and vicinity commenced in the spring, and progressed moderately until the time of the quarterly meeting, which was held on the 25th and 26th of September 1824. The Wayne Sentinel article stated: A reformation is going on in this town of great extent. The love of God has been shed abroad in the hearts of many, and the outpouring of the Spirit seems to have taken a strong hold. 5. Linda King Newell and Valeen Tippetts Avery, Mormon Enigma, Emma Hale Smith, University of Illinois Press, 2nd edition, 1994, p. 25. 6. On page 78 Cowdery corrects a printing error regarding Joseph's age. When Cowdery begins the account of Mormon origins on page 42 he mentions the revival and Joseph's age as being fourteen. In the next issue, when he continues the story on page 78, he dates the revival as being in 1823 and corrects Joseph's age to seventeen-years-old.